For some reason I am completely cool with Brits calling me a Yank, but I get unnerved when my own countrymen from the Southern states call me a Yankee. That’s more than likely because I was born and raised in Texas and grew up being proud of my Southern heritage...and occasionally making fun of the Yankees in the Northern States. 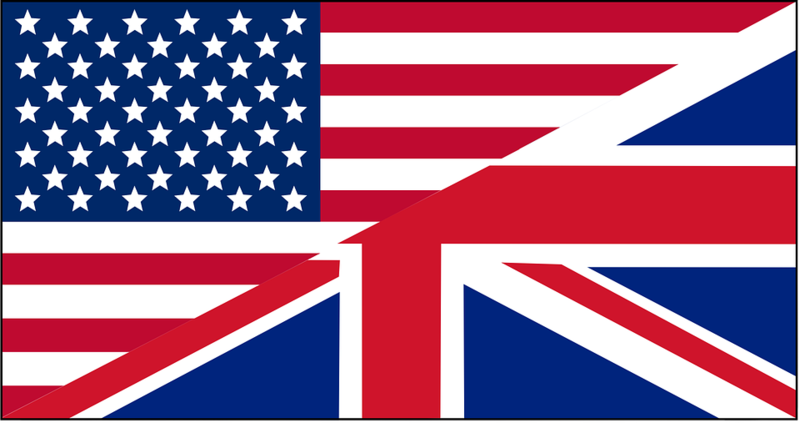 I figured I would take the time in this post to review a couple differences between life in the US and life in the UK. My own personal experience with life in the UK is fairly limited and somewhat flawed. Besides history and the news, my “education” of life over there comes mainly from movies and we all know how accurate they are. My first real world education about life in England goes way back to 1987. Mark Thatcher, son of then Prime Minister Margaret Thatcher, married a woman from our church in Dallas, TX. My parents had the pleasure of attending that wedding in London. This trip for them included a wedding dinner at the Savoy Hotel and getting to meet the Queen. Since that’s probably not an everyday occurrence for most of you living in the UK, I would consider that a flawed impression. As of late, I have noticed that a large number of the bloggers I follow are from “across the pond.” (Sorry – I love saying that almost as much as “grab a pint at the pub.”) Since there isn’t a whole lot jumping out at me as different in their lives, I thought I better do a little research to help identify some of our differences. Fortunately our differences are fairly trivial with the exception of that whole Revolution thing back in 1775. I turned to the BBC for info and found two lists to get me started. “10 Things Americans Do That Drive Brits Nuts” and “10 Things Brits Do That Drive Americans Nuts” are what I found. For the sake of not turning this into a novel (I have a bad habit of doing that because I ramble. ), I am only going to cover item #1 on each list. Saying "I love your accent" is apparently the top complaint Brits have about Yanks. I can understand that. It's how you talk. Deal with it. Right? I think it's similar to the way my wife giggles every time I'm talking to one of my buddies from East Texas and my old Southern Drawl slips out. It's kind of funny because I never had much of a drawl to begin with. That makes me wonder if I would start talking with a British accent if I were to spend any amount of time talking with a Brit. Apparently, Americans put food on the top of their list because "overcooking vegetables" takes the #1 spot on the list. I don't know how to feel about that for two reasons. First, it supports AND disputes the concept that Americans are all fat. Putting food at the top of the list supports that concept, but the fact that it involves vegetables kind of disputes it. Second, I always thought we were know for hot dogs and apple pie. When did we start caring about vegetables? I'm not sure overcooking vegetables is a valid complaint, but I won't fight it too hard since it could be a lot worse. In general, it looks to me like we should have no problem getting along. Especially if a pint at the pub is involved. I will promise not to comment on your accent (and try not to accidentally mimic it) if you promise not to serve me vegetables. I would be completely fine with you substituting the vegetables with a side of those sausage rolls Mike wrote about yesterday. Nice. It's fun to make these comparisons. Most Americans I know love British accents, and maybe those comments are annoying to Brits, but they really are meant to be complimentary. :)I have to agree I wouldn't like my veggies overcooked, although I didn't know the UK had a reputation for that. Jesse, I agree with you on the sausage rolls. I think we are missing out on something. Hmmm.... I always thought the number one issue for Americans was the sissy English "football" they play where the violence is in the stands and not on the field where it belongs. Football indeed! Snort. Yeah, I know Mike is going to get me for that one! I would like to, but I do have to admit that our footballers do seem to have a tendency to spectacularly fall over and clutch their faces in agony whenever someone just misses touching their ankles. Mind you, check out Aussie Rules football - scary indeed.